Hey and welcome to my personal space on the interwebs! 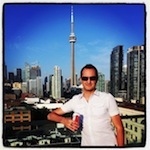 My name is Frank and I help companies build digital products for a living and currently live in downtown Toronto, Canada. After 16 years working with technology, I’m now an expert in leading Agile teams to solve real problems with innovative digital products that customers love using. I currently work as an Agile Coach and Consultant with the awesome folks at Agile By Design, assisting teams and organization to become more effective through adopting agile mindsets, techniques and practices. I also became an AIPMM Agile Certified Product Manager in 2014, and prior to that, graduated with honours from the Entrepreneurship & Strategy program at Ted Rogers School of Management in 2010. I’m always looking to broaden my personal and professional skills and knowledge, and would love to connect with you to do just that. Send me an invite today on LinkedIn!